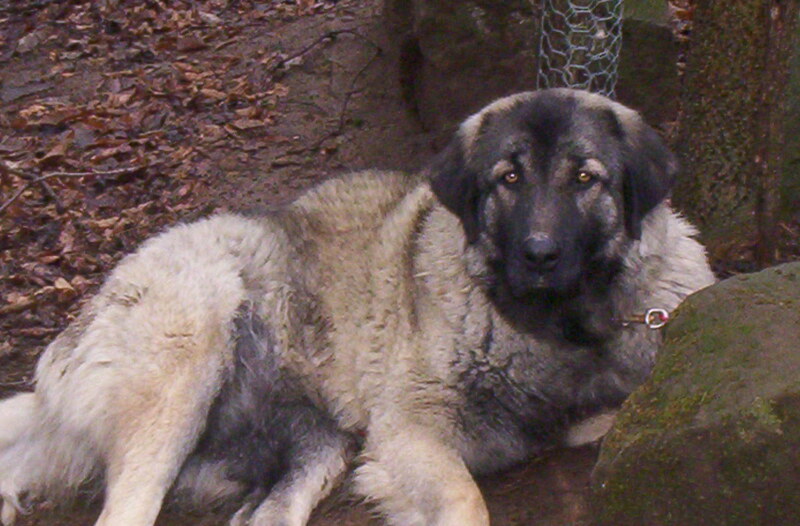 Miss Daisy, a purebred Sarplanenac (Yugoslavian Guard Dog), our first Livestock Guard Dog. 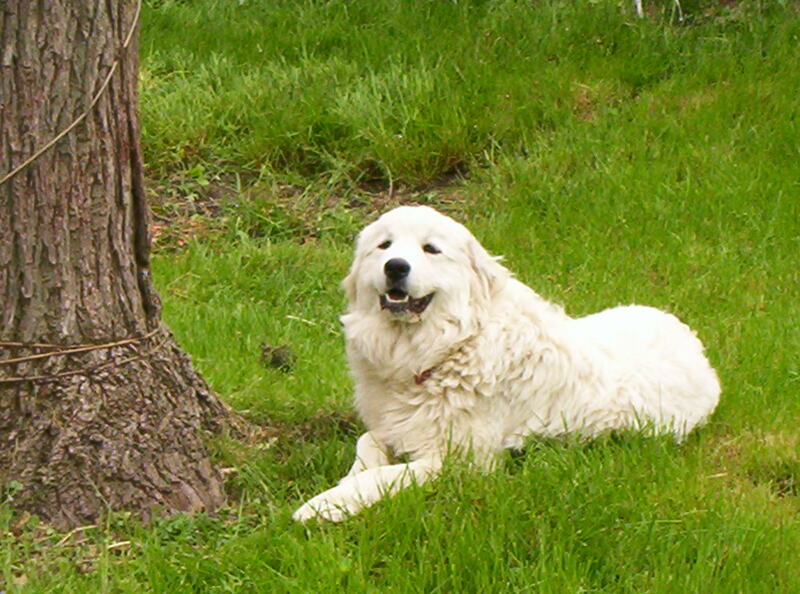 Good Golly Miss Molly, our AKC Registered Great Pyrenees Guard Dog. 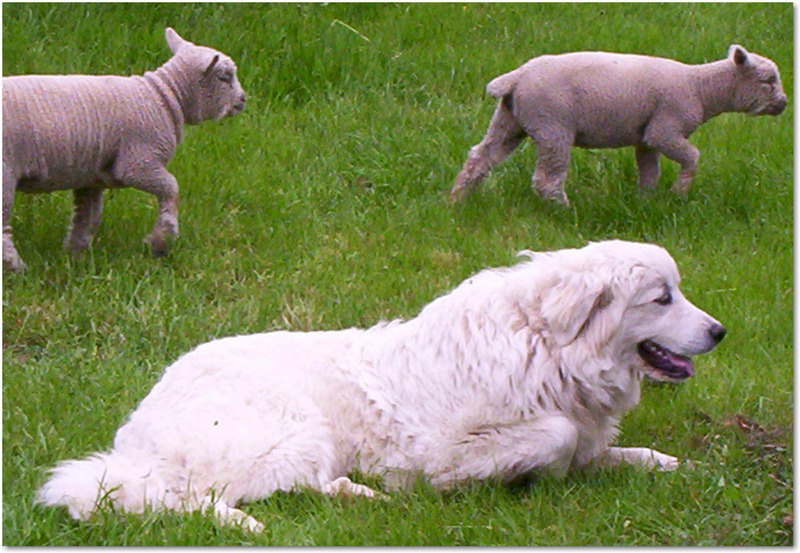 Molly is our Alpha LGD Dog and devoted to the sheep. 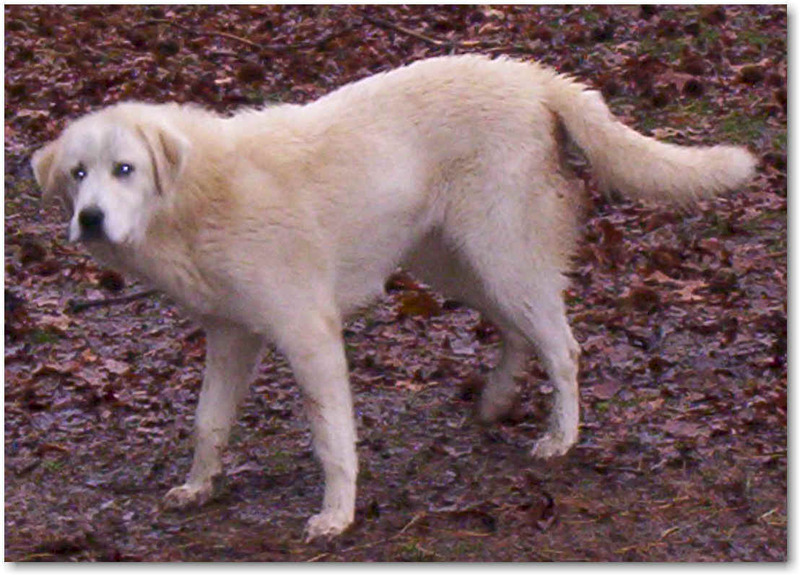 Sweetie, one of our 7/8 Great Pyrenees 1/8 Anatolian Shepherd Guard Dogs. 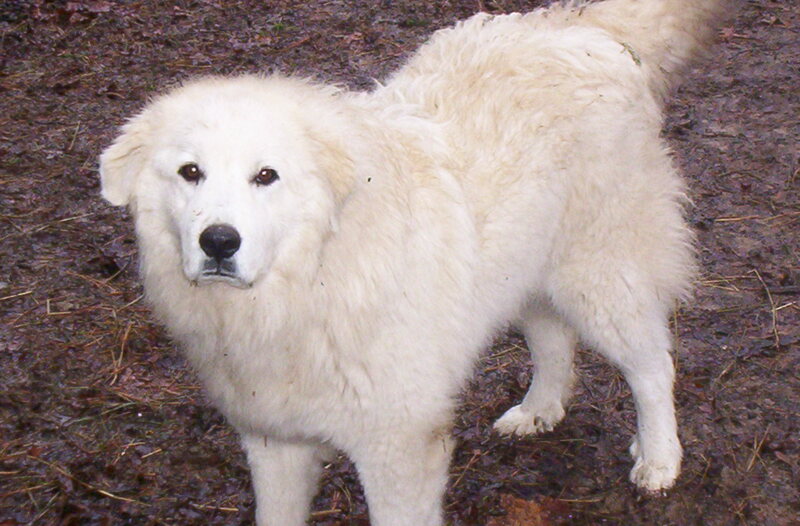 Sweetie looks more like a Pyrenees than an Anatolian. 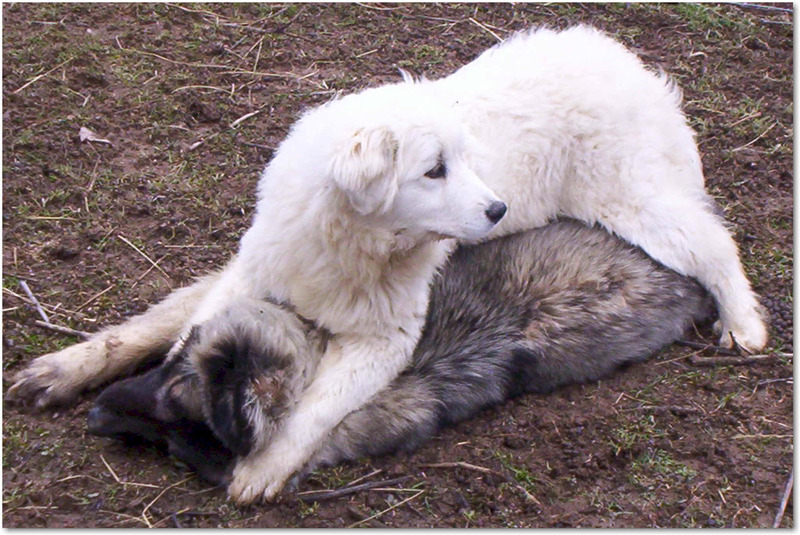 Patti, Sweetie's sister, is 7/8 Pyrenees and 1/8 Anatolian Shepherd. Patti resembles an Anatolian Shepherd more than she does a Pyrenees. 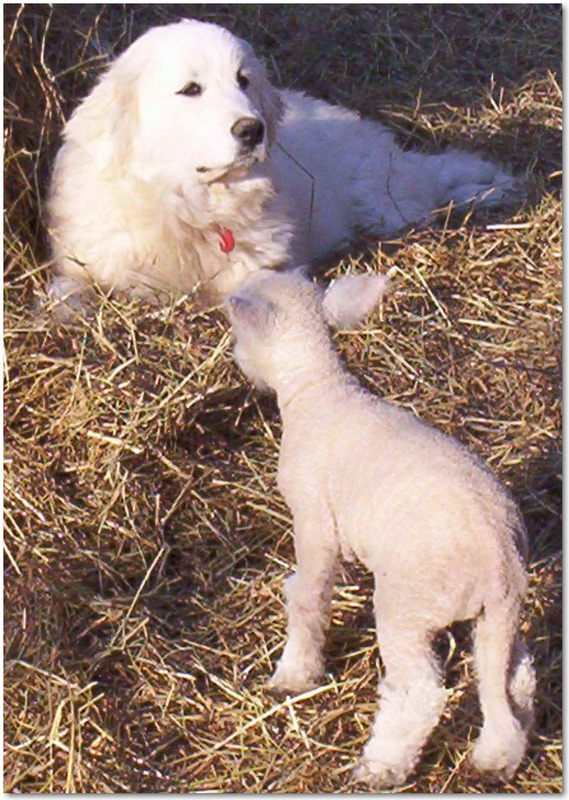 Daisy was our very first Livestock Guardian Dog (LGD). 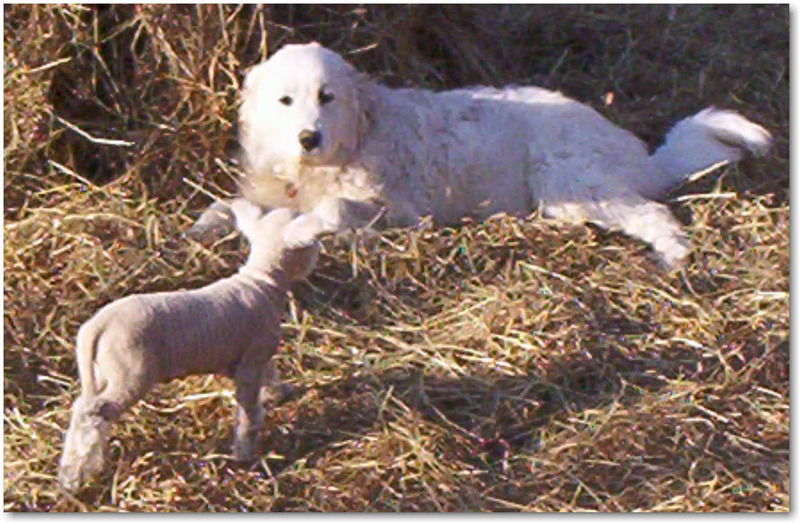 We already had a Guard Llama living with our Babydoll Sheep, but felt that since their pasture was close to a patch of woods that a Guardian Dog would give the sheep another layer of protection from predators. 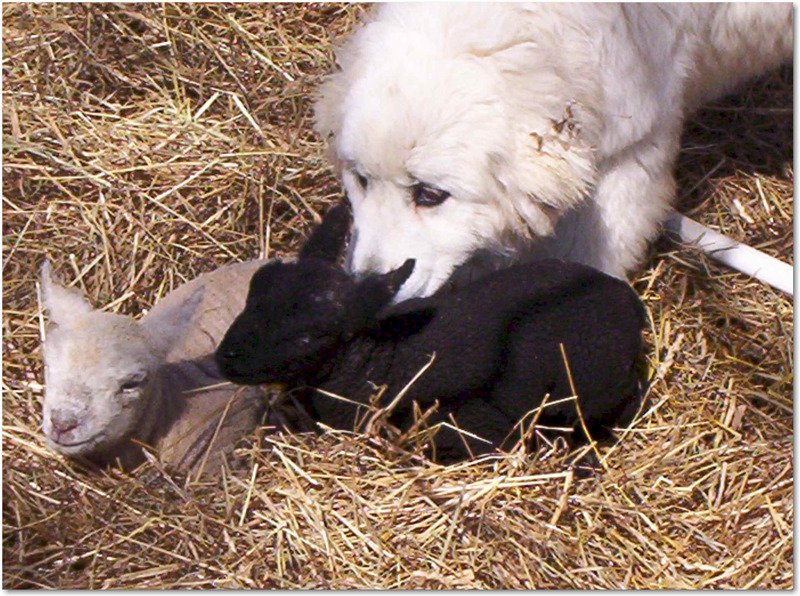 We knew very little about Livestock Guard Dogs, and Daisy's breeder told us that since Sarplanenac's were bred to guard we should just take the then 12-week-old puppy home and put her right in with the sheep to guard them. Well, as the saying goes, "If it seems too good to be true, it probably is." Oh, Daisy loved the sheep, alright. But she was also very lonely after leaving her brothers and sisters. The sheep looked like they'd be fun to play with (Daisy had been used to larger livestock at her previous farm) so the chase ensued. We tried everything we could think of to discourage Daisy from her games of "Sheep Tag" and using the sheep for chew toys. We read about LGD's, discussed our situation with experienced breeders, etc. But every suggestion we tried seemed like a big game to Daisy. A game she was determined to win. We were almost ready to give up on LGD's and sell Daisy until someone suggested we get a 2nd dog--someone that Daisy could play with. Hmmm...well, if the 2nd dog didn't work out any better than Daisy we'd then have 2 dogs that were not protecting sheep. After much praying and talking we decided to give Daisy one last chance at proving herself. Molly was 6 months old when we first saw her and she'd been brought up from birth on a goat farm. The owners of the farm had sold their goats and the dogs were forlorn without a job to do. Molly was even more forlorn to leave her home and would not even look in our direction the entire 4 hour trip home. This did not inspire us to believe that she would make the difference we had hoped for in Daisy. But something happened when Molly entered the Babydoll Pasture. Her eyes brightened when she saw the sheep and she looked up at us as if to say, "Thanks for the job." Daisy was so thrilled to see another dog she threw herself at Molly. Molly growled at Daisy telling her that she had more important things to do, then proceeded to make a thorough sheep inspection. Probably to get Molly's attention, Daisy decided to show her new friend how to play "Sheep Tag". Molly was not amused. In fact, she chased Daisy (twice her size) then pinned her to the ground. Daisy was, once again, so happy to have a friend that she didn't exert her weight and size to reciprocate Molly's actions. That was the last time Daisy chased sheep or anything else but Molly. What a blessing! 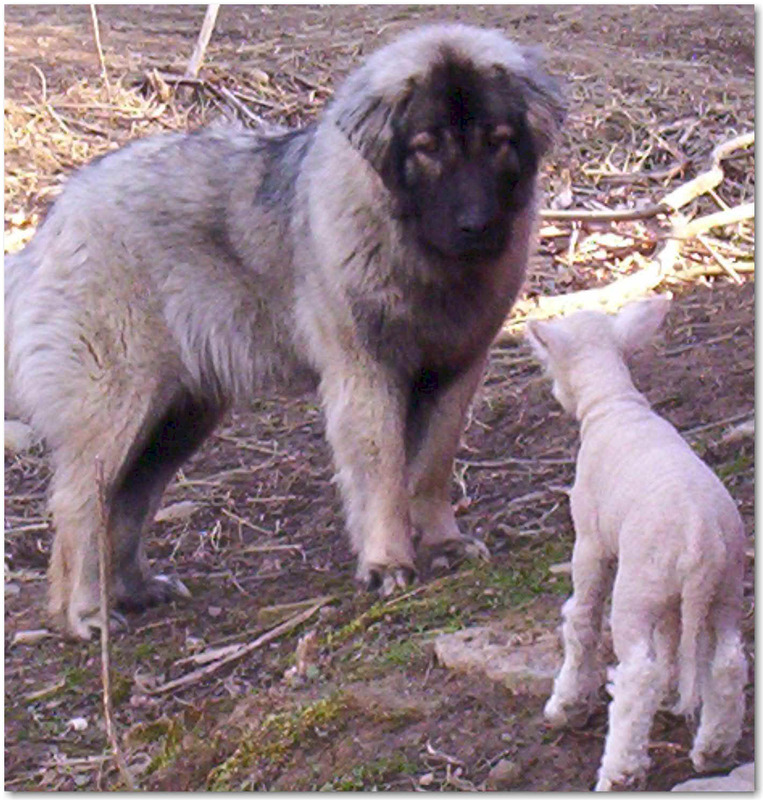 Molly is what a true LGD should be, strong enough to ward off predators--gentle enough to dry off lambs (which she did when lambs began arriving only 4 days after she came to our farm). Because we were so impressed with Molly's ability and the change she had made in Daisy's desire to also guard, we decided to add 2 more female guards to the pasture. Sweetie and Patti joined the girls in the Summer 2005. 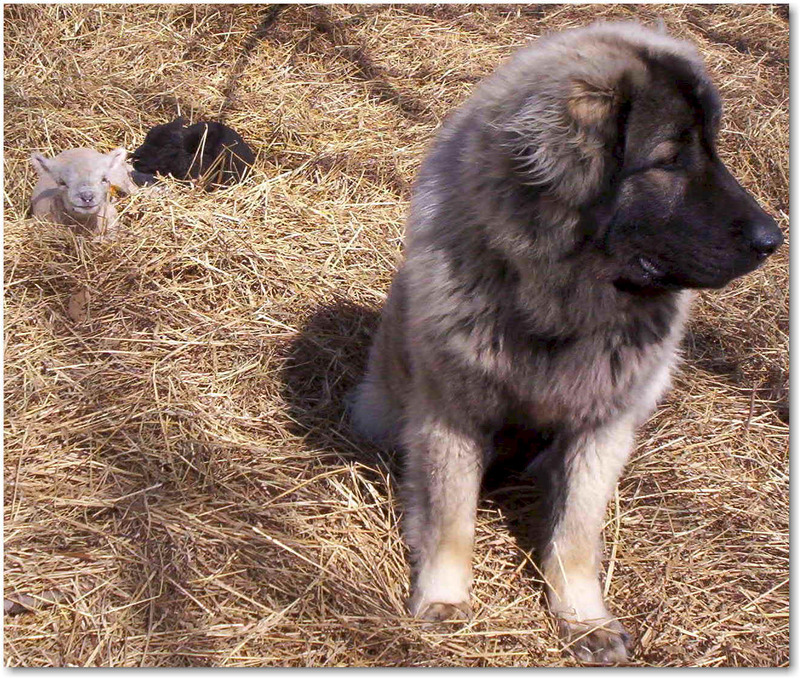 One of our preliminary goals in purchasing LGD's was to only use AKC Registered Dogs as guards. 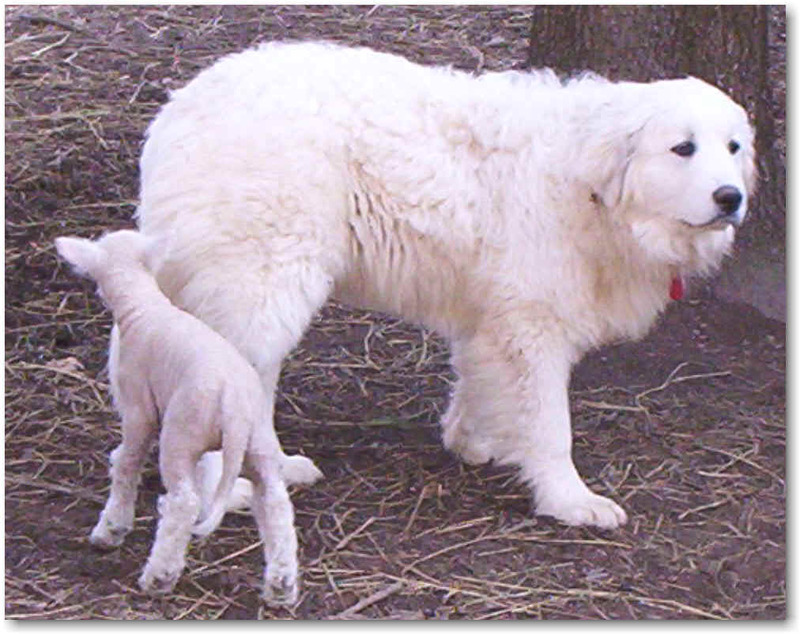 However, Sweetie and Patti had been brought up with sheep and we felt they would also make excellent guards since Pyrenees and Anatolians are commonly used as LGD's . They have proven to be very good guards and respect their place in the pasture heirachy. The 4 girls together are a force to be reckoned with. 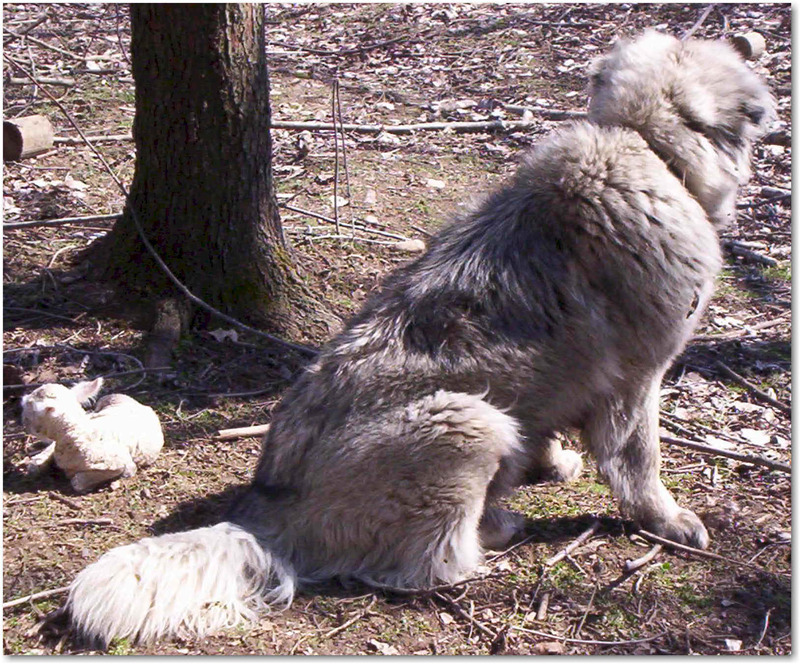 Coyotes and other predators tend to send in part of their pack to lure guards away from their livestock then attack the unguarded livestock from behind. Molly, Daisy, Sweetie and Patti have somehow decided between themselves who should stay with the livestock and who will go after predators and recently displayed their guarding ability during hunting season. We are in awe of their dedication to their flock and blessed that God guided us to choose Molly and move in this direction instead of giving up on LGD's. We sleep well every night knowing that our Heavenly Father and the girls are on patrol! We can't wait to have our own pups and hope to offer "ready to guard" pups soon. 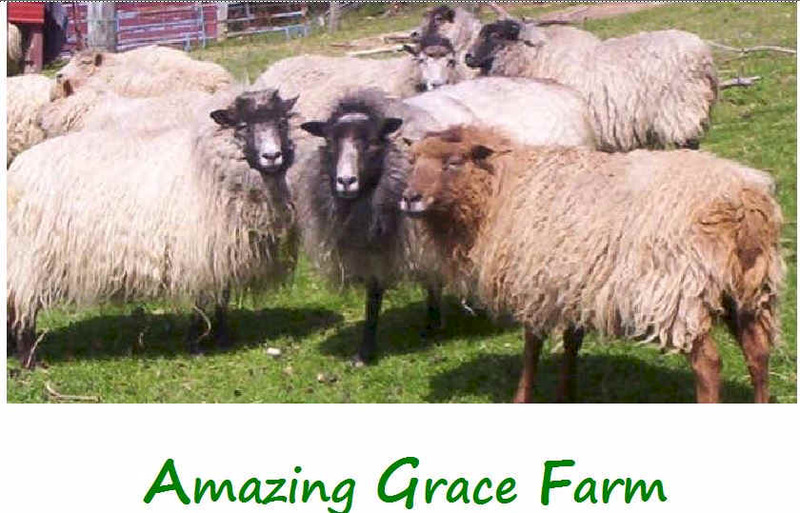 Send mail to agl@amazinggracefarmscom with questions or comments about this web site.